Marisha Simons attempted to catalog human impact upon the environment in her installation, Ghost Forest. Ghost Forest was part of the show Ghosts and Shadows from September 6th, 2008 – January 2nd, 2009 presented in partnership with the Center for Emerging Visual Artists and guest curated by Warren Angle. Simons was one of the artists selected to produce site specific installations because of their work’s poetic sense of place. 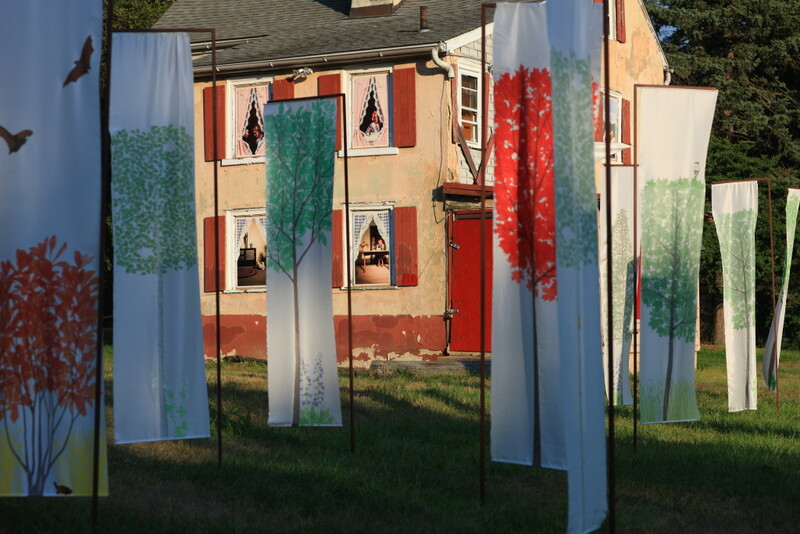 Each artist set up a dialogue with the natural and human constructed landscape at the Schuylkill Center’s Second Site location, Brolo Hill Farm, a once working 18th century farm. Artists mined specific references to place and sensations of past and present. Simons’ resulting airy tapestries flowed in the wind, reminiscent of plants and animals that once thrived before human impact on the environment. Ghosts and Shadows was the first exhibition to be presented at the Schuylkill Center’s Brolo Hill location. “I have created a visual representation of a selection of endangered and extinct plants and trees, and I invite the viewer into a forest of ghost plants: translucent silk panels that move when the viewer walks past, delicate images floating above the ground, no longer planted in the earth with a subtle epitaph sharing the plant’s history.